Before ordering your garden building please read our terms & conditions below. Customers to prepare a solid flat level base (e.g. slabs, concrete or decking). Access to garden must be obstacle free and clear. Sheds wider than 6' must have no height restriction. If you cannot accommodate you must inform us when ordering so we can make the sections smaller which an extra fee will be incurred. If the customer prepares a wooden frame is intended for the building to be sited on, this will not be adequate and must be fullt boarded with decking that is level and flat. After finishing your purchase online we will contact you so you can add your custom finish to the shed, adding any extras will cost a little extra. Payment of any remaining balance to be paid on delivery. Free Delivery and instillation for Midland area 30 mile radius from B8. For further than 30 miles email us for a delivery quote. We do not guarantee shed felt but if leeks appear at the first sign of rain please contact us. 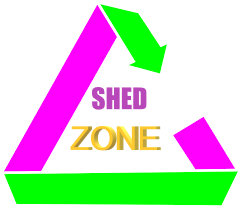 As stated, sheds are only dip treated which offer no weather resistant qualities, so a solvent based wood protective treatment must be applied inside and out as soon as possible. Failure to do this will impact the the state of the building in a shorter time frame. Read our Maintenance page for more information. Expect delivery delays due to adverse weather conditions were it would be a hazard to drive and install a garden shed. Conditions like, torrential rain, snow, ice and gales. Warping, Shrinking and expanding of any of the wood used to make our buildings. Any mould growth on any wood that is used to construct our timber buildings. Any cracks or knots falling out of buildings that have been bought from us. We will not be held responsible for any leaks that occur 48 hour after our installation team has assembled your building. Uneven bases are unsuitable for any garden building to be sited and can create issues with your building and we will take no liability for any such problems. We are not liable for any problems what so ever on buildings that are self installed.